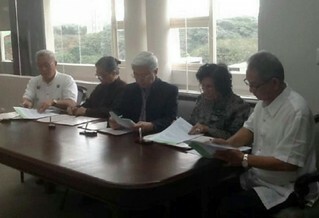 Updates on UPAAA Programs - University of the Philippines Alumni Association in America, Inc. In 2017, UPAAA sponsored the registration fee of a UP Mindanao student at the Asian Pacific Future Leaders Conference in Kuala Lumpur, Malaysia. The following year, UPAAA sponsored the following: (6) a donation to the UP Diliman Men's Varsity Baseball Team, for their uniforms; (7) partial to full funding for projects of the following student organizations in UP Mindanao - Food Technology; Dugong-Antro; Society of Programmers and Refined Computer Scientists (SPARCS); Pre-medical Association; The Navigators; UP Mindanao Mountaineering Society. UPAAA has offered seven (7) stipend scholarships to UP - one for each of 7 of the 8 constituent universities (CUs) The scholarships have been opened to students whose families’ annual income is less than PhP80,000. The CUs are UP Diliman, Manila, Los Banos, Baguio, Cebu, Visayas (Iloilo and Tacloban), and Mindanao. In the picture are Prof. Niel Jamandre and Mr. Aris Dacanay of UP Diliman OSSS (Office of Scholarships and Student Services), UPAAA Luzon Liaison Nina Lojo and UPAAA Secretary Joy Celo after the MOA for the scholarships was completed. When more funds are available from donors to UPAAA, UP Open University will also receive a scholarship slot and more scholarships will be offered. Please consider donating even small amounts to UPAAA for this worthwhile project. Give back to UP by giving a struggling student the same opportunity you had to graduate from our great alma mater. There is strength in numbers; 1,000 alumni donating even just $10 each will open up 7 more stipend scholarships! Think of how many more we can help with $50 each from 1,000 alumni. Tuition and other fees are now free in all state universities. Stipends are still needed, however. turns over donation check to UP Mindanao Chancellor, Sylvia Concepcion. 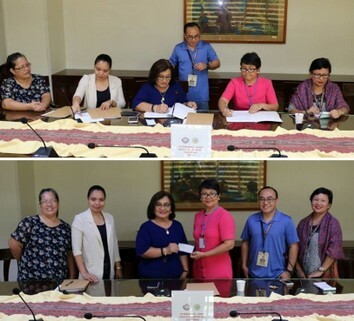 A formal donation ceremony for the UPAAA Inc. Student Scholarship Fund was held at the Office of the President, Quezon Hall in UP Diliman on January 27, 2015. 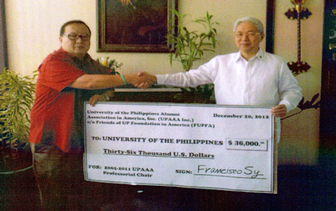 The fund to benefit needy students at UP Visayas and UP Mindanao was raised from the proceeds of the 2013 UPAAA General Assembly, Convention and Reunion held at the Treasure Island Hotel and Casino in Las Vegas , Nevada, and augmented by the generous contribution by the UPAA Nevada of their share of the proceeds, as co-sponsor of the 3-day event.